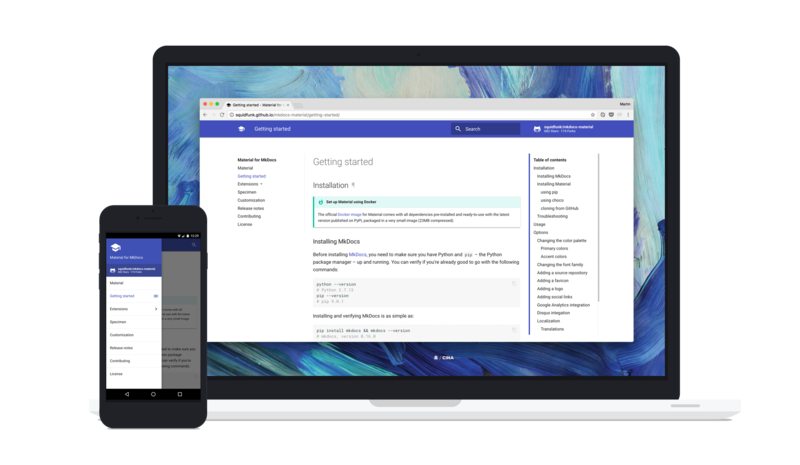 A Material Design theme for Paradox, a static site generator geared towards project documentation. It is based on the excellent MkDocs Material, which is built using Google's Material Design guidelines. See the documentation for how to start using the theme. The theme also uses the tabs component from Material Components for the web (Apache-2.0), Modernizr (available under BSD/MIT licenses), Prettify (Apache-2.0), Material Icon font (Apache-2.0), and FontAwesome (SIL Open Font License). Optionally, it can load fonts, like the Roboto font (Apache-2.0), from Google's font CDN. All copyright of their respective authors.